A group of radical performance activists who hail from New York staged an “exorcism” of corporate power outside an international law firm in London to raise awareness about the dangers of an EU-US trade deal being brokered behind closed doors. The group, Reverend Billy & The Stop Shopping Choir, conduct creative and political performances across the globe to preserve local communities, life and the imagination. In a symbolic act of political protest on Thursday, the performance artists targeted the London office of global law firm King & Spalding over its role in Transatlantic Trade and Investment Partnership (TTIP) litigation. The firm has represented a slew of corporations in lawsuits against governments through a controversial investor protection mechanism – a version of which may form part of TTIP. The Investor-State Dispute Settlement (ISDS) mechanism in question has been the focus of criticism in Europe and America, with anti-TTIP academics, trade unionists and politicians warning it will pave the way for corporations to sue governments attempting to legislate in the interests of ordinary citizens. Using this mechanism, King & Spalding has aided multiple corporate clients who are engaged in a series of bilateral trade pacts. Among these were Enron and Mobil’s legal actions against the Argentinian government, and Chevron and Texaco’s legal actions against the Ecuadorian government. The creative spectacle was co-organized by UK think tank Global Justice Now. “King & Spalding have represented countless corporate clients in suing governments for making decisions that have benefited workers' rights, public services, or protected the environment,” Guy Taylor, a leading trade campaigner from Global Justice Now, told the Solicitors Journal. “The controversial EU-USA trade deal TTIP would massively ramp up the ability of corporations to carry out court cases like this,” he said. 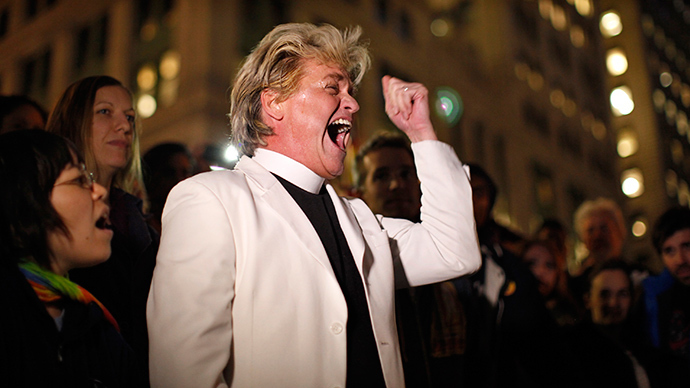 On Friday evening, Reverend Billy & The Stop Shopping Choir are also expected to attend a 10-day spectacle of dissent organized by Occupy Democracy in protest against corporate capture, environmental chaos and cronyism. Billed as a Festival of Democracy, the affair will feature a diverse series of workshops, artistic performances, creative direct actions and discussions throughout the election period. It will begin on Friday evening and finish on May 10.